The census of people takes place every ten years. 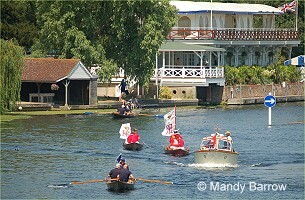 The census of swans takes place annually during July on the River Thames in a ceremony known as Swan Upping. 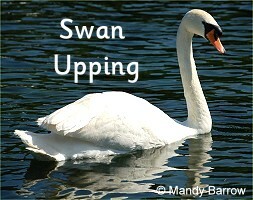 Swans are counted and marked on a 70 mile, five day journey up the River Thames. The swans on the River Thames are Mute Swans (Cygnus olor). They are not actually mute, they can honk and hiss alot. Mute swans are seen in Britain all year round and are distinguished by a bright orange beak, which has a knob of black tissue on the top. The Swan Uppers catch and check the health of the swans and their cygnets through five counties, from Sunbury-on-Thames, Middlesex, to Abingdon, Oxfordshire.